Franke, Maria. "Black-footed Ferret". The Canadian Encyclopedia, 01 August 2018, Historica Canada. 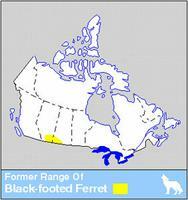 https://www.thecanadianencyclopedia.ca/en/article/black-footed-ferret. Accessed 23 April 2019. The black-footed ferret (Mustela nigripes) is a member of the mustelid family, commonly referred to as the weasel family. This black-footed ferret is one of the first to step onto Canadian soil after over 70 years when the last one was seen (courtesy Toronto Zoo). 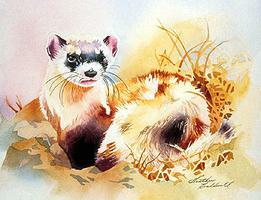 Extirpated in Canada since 1937 but reintroduced in 2009, the black-footed ferret may be the rarest mammal in North America (artwork by Heather Caldwell). The black-footed ferret (Mustela nigripes) is a member of the mustelid family, commonly referred to as the weasel family. It was, until recently, considered extirpated from Canada. Black-footed ferrets are currently listed as endangered by the United States Fish and Wildlife Service (USFWS) and the International Union for the Conservation of Nature and Natural Resources (IUCN). The last specimen taken in Canada was captured in 1937 and it was officially listed as extirpated in Canada in 1978 by the Committee on the Status of Endangered Wildlife (COSEWIC); however in 2009 a Canadian reintroduction program began releasing black-footed ferrets into Grasslands National Park and neighbouring ranch land in Saskatchewan. The black-footed ferret is long, slender and short-legged. Their head and body length ranges between 38 and 50 cm and their tails are 11-15 cm long. A male black-footed ferret weighs 950-1100 g and a female 750-900 g. They can be identified by their black feet, face mask and tail tip. 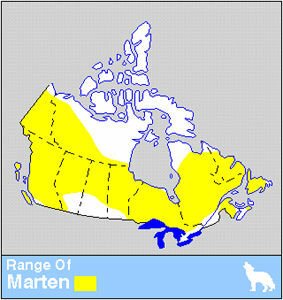 The coat is generally coloured yellow-buff with a paler underside. The forehead, muzzle and throat are nearly white. The top of the head and the middle of the back are brown. The black-footed ferret is a prairie animal usually associated with prairie dog towns, but ranged beyond them in southern Alberta and Saskatchewan. Its main food is prairie dogs but ground squirrels and other small mammals are also taken. 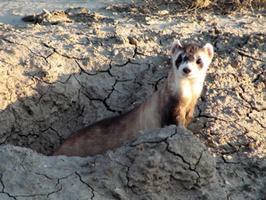 Black-footed ferrets were believed to be extinct by the late 1970s. Amazingly, a small population was discovered in Meeteetse, Wyoming in 1981. After nearly being wiped out by outbreaks of sylvatic plague (a plague affecting wild rodents and spread by fleas) and canine distemper in 1985, the last 18 wild ferrets were brought into captivity to establish a breeding and reintroduction program as the final attempt to save the species. Today ferrets have been released at 17 sites in the United States, one in Mexico and one in Canada. Mating occurs in March and April and litters of 1 to 5 (usually 3 or 4) are born 42-45 days thereafter. 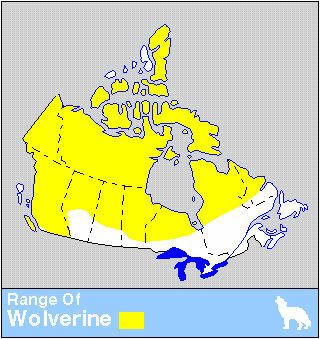 The kits are independent by late August to October.